I signed-up in February for a couple Volunteer Vacations organized by the American Hiking Society. 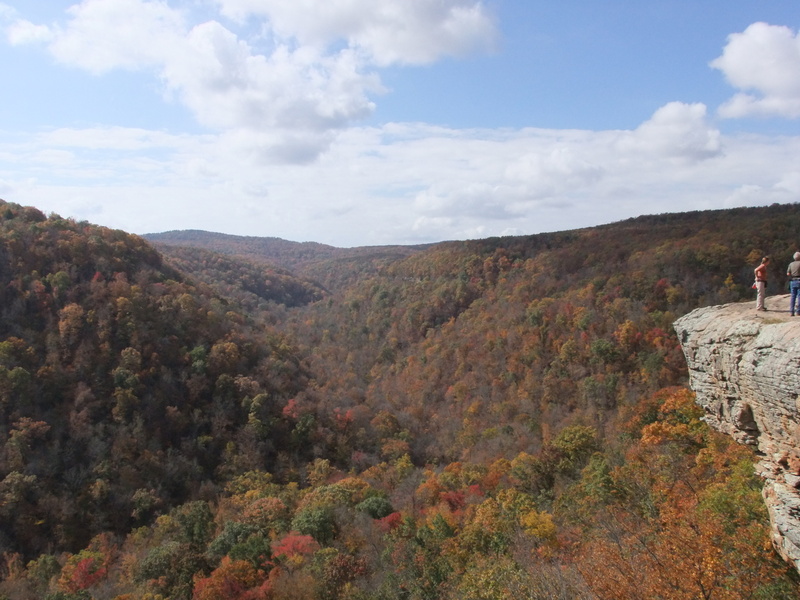 I completed the first one in May and have now completed the other – a week of trail maintenance and hiking in the upper Buffalo River area. It was my first time on the Buffalo and it didn’t take long to see why so many people fall in love with the area. 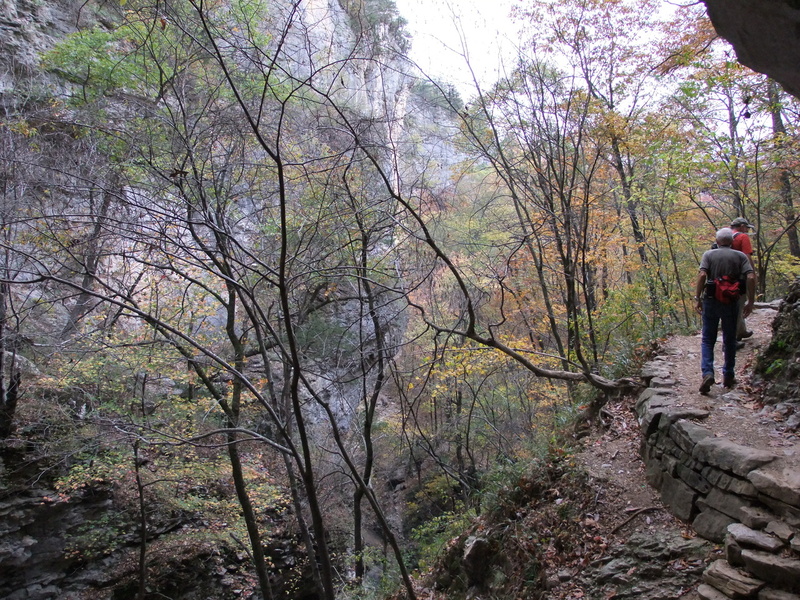 The autumn color was near the peak so that certainly helped. The original plan was to camp at South Maumee campground on the lower Buffalo and build new trail west of there. Our National Park Service host and task master for the event was to be none other than Ken Smith – who literally wrote the book on this area. A week before the trip began the plan changed. 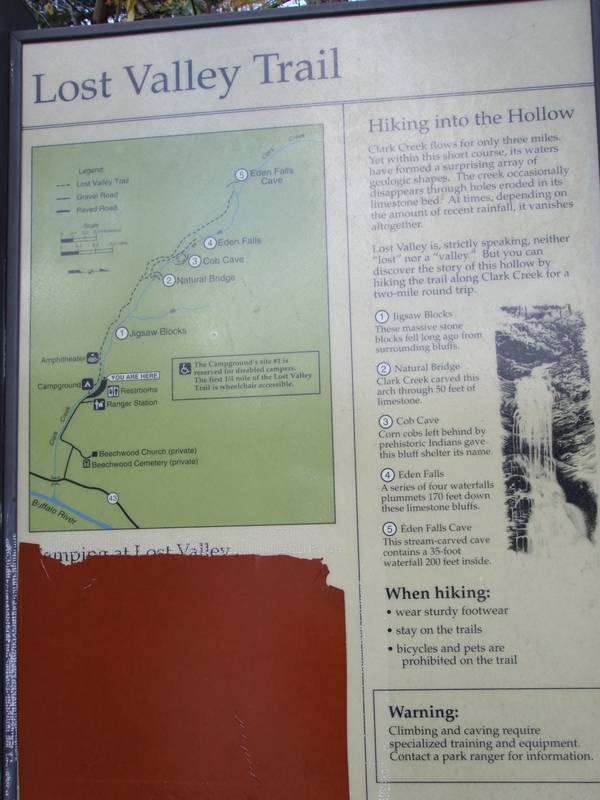 We were to stay at the Steel Creek campground in the upper Buffalo and do maintenance on the Bench Trail instead. 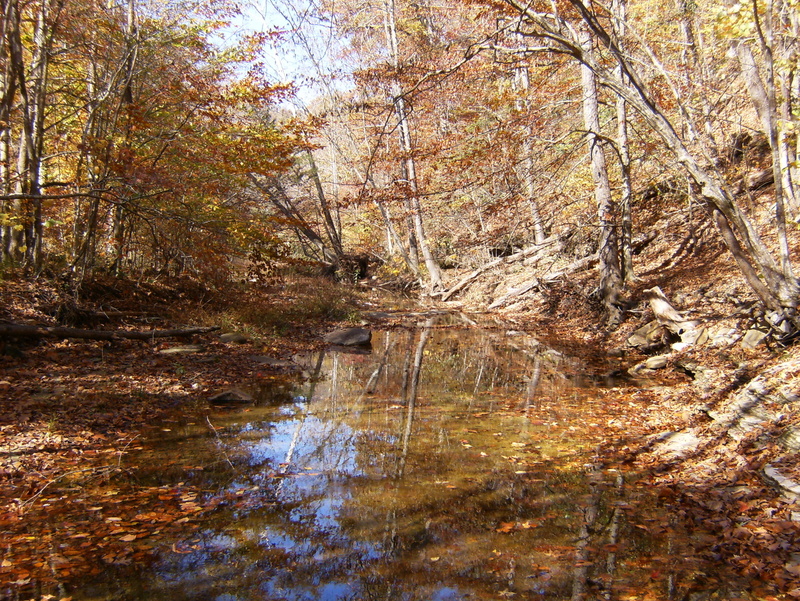 Steel Creek CG is next to the river, opposite Roark Bluff. Here you see the equestrian area with the old ranch (now a NPS office) in the lower left. We were in the tent area back around the bend and to the left. 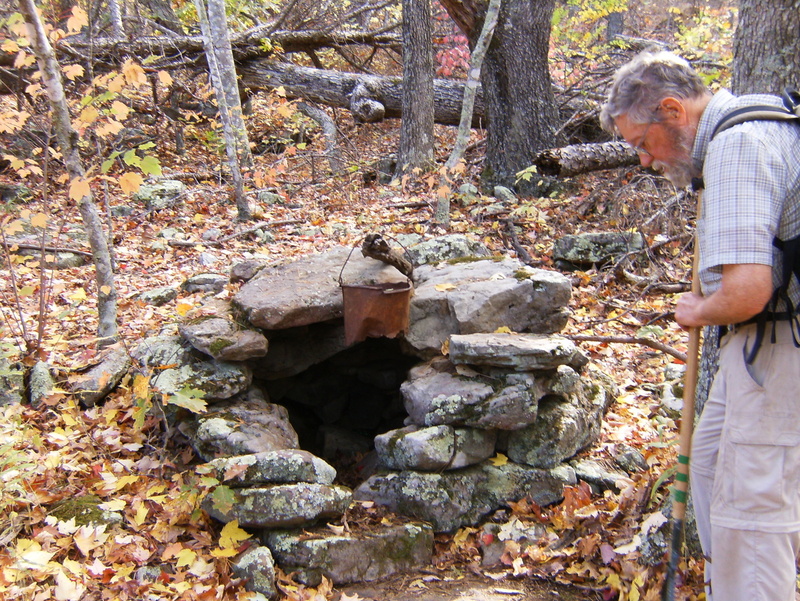 They have potable water and flush toilets but no showers. The crew of 12 arrived on Sunday, set up camp, and got to know one another. After Monday morning breakfast Ken started discussing work plans and I was pleasantly surprised that the Bench Trail was not on the agenda but that Hemmed-in Hollow was. 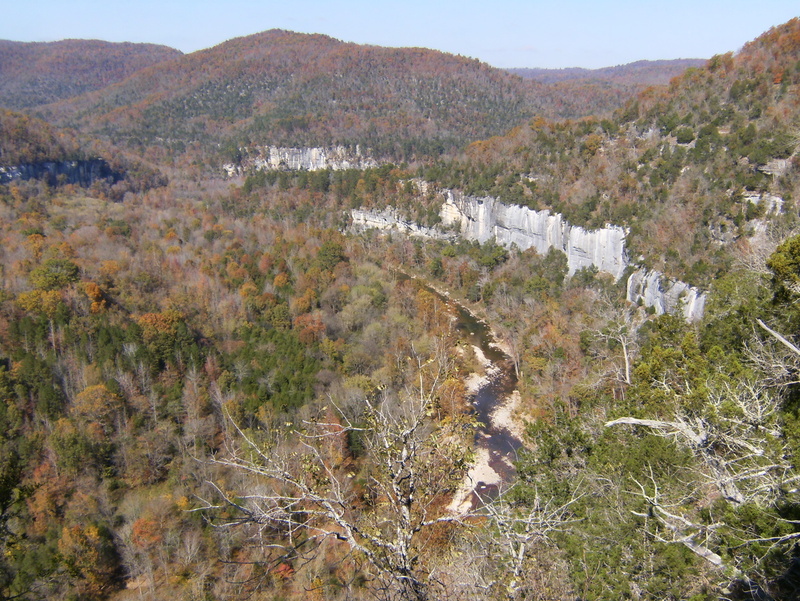 This is one of the most famous trails on the Buffalo – and probably in the whole region – featuring the tallest waterfall (204′) between the Rockies and Appalachians and I now had the opportunity to see it during one of our work days rather than using a precious free day. It took me no more than 1/10 second to volunteer for that crew. We started at the Compton trail head, which meant a descent of about 1000′ over 2.5 miles, and of course, a heck of a climb on the way out. There was some great scenery along the way. On the way down we trimmed brush encroaching on the trail, removed some fallen trees, and even raked leaves from the stone stairs. Once at our destination, we weren’t surprised to see very little water flowing over the falls but it’s still a heck of a sight. 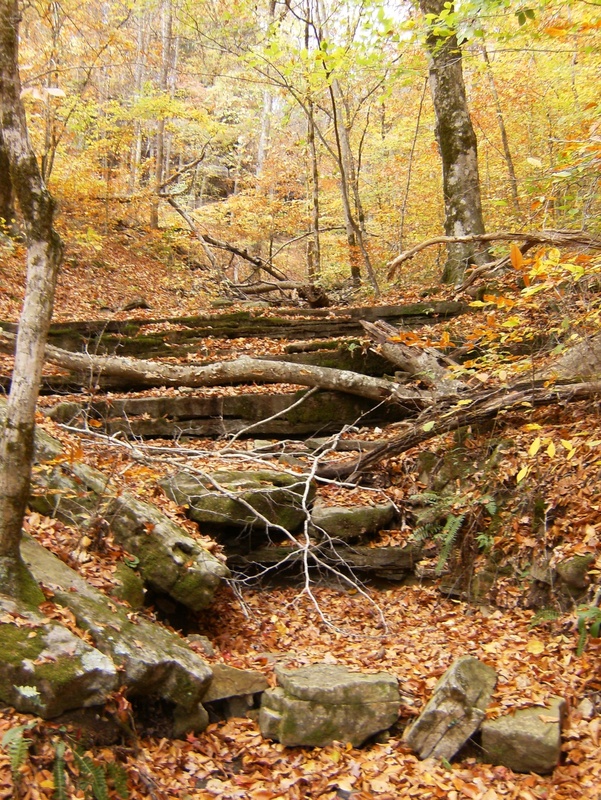 The scour below Hemmed-in Falls. On Tuesday I accompanied a different crew. As we drove south of Ponca on highway 43, we saw 3 groups of elk grazing in the grassy areas east of the road – maybe 30 animals in all. It was the first wild elk I’d ever seen but I wasn’t able to get any pictures. 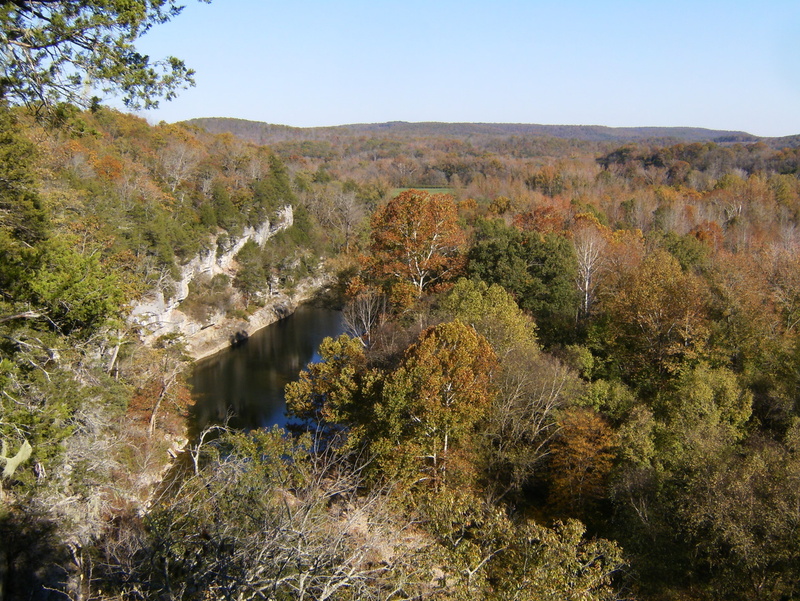 We turned on a private road that intersected the Buffalo River Trail a bit west of Running Creek, near mile marker 8. 2 guys headed south to finish what they started the previous day while I headed north with 2 others. 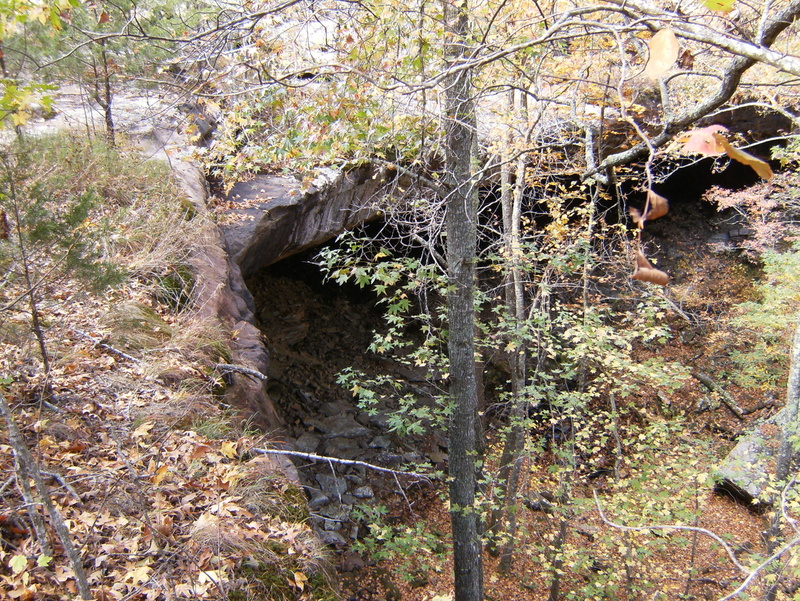 Notable features were a small dry waterfall and 2 large sinkholes. We trimmed lots of brush and were able to clear all but 1 tree from the trail. We finished the day at the Ponca bridge (mile marker 11). 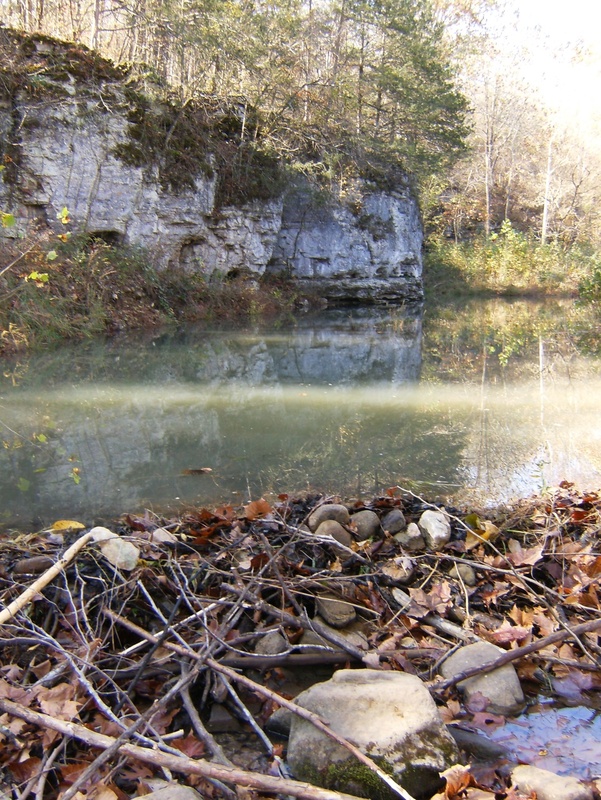 One of the sinkholes at BRT mile 10.3. 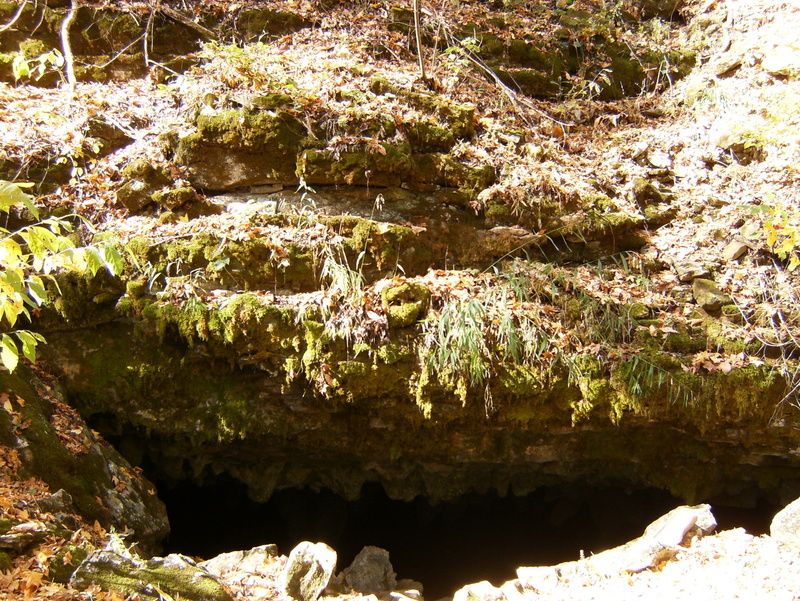 I think this probably qualifies as a cave. Wednesday was our day off. Traditionally, the park service provides canoes for a float trip but this year they’d also have to provide a heck of a lot of water so that was scratched. 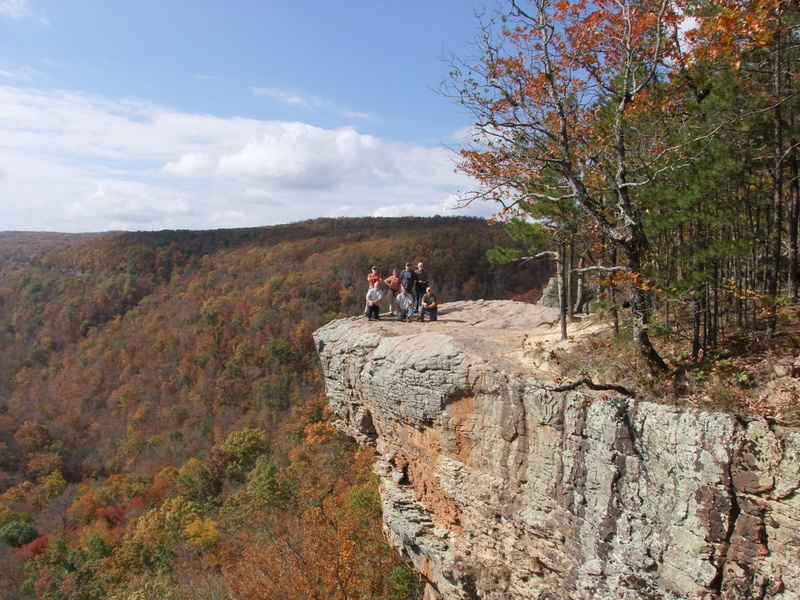 Many of us instead headed for another of the very famous area features – Hawksbill Crag. 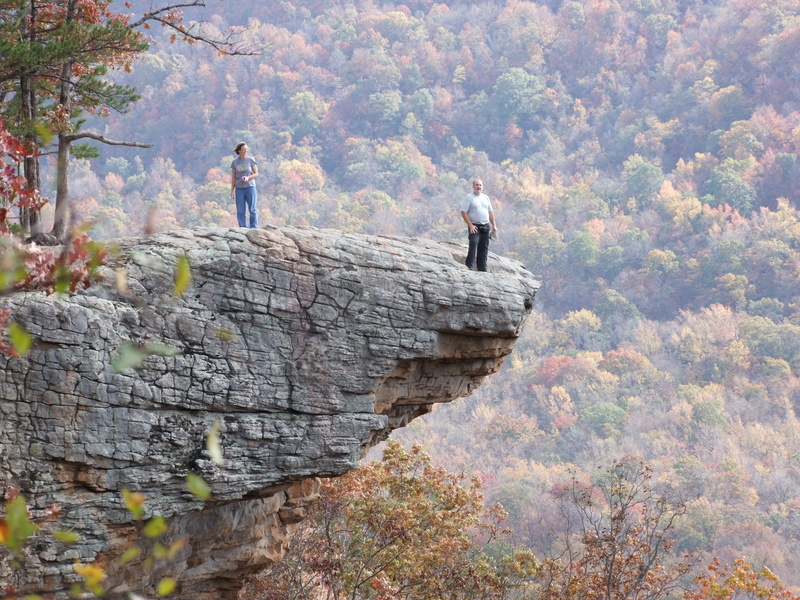 Generally considered to be the most-photographed place in Arkansas, it’s a rock sticking out over, and way the heck above the Whitaker Creek valley. Me out on the rock. 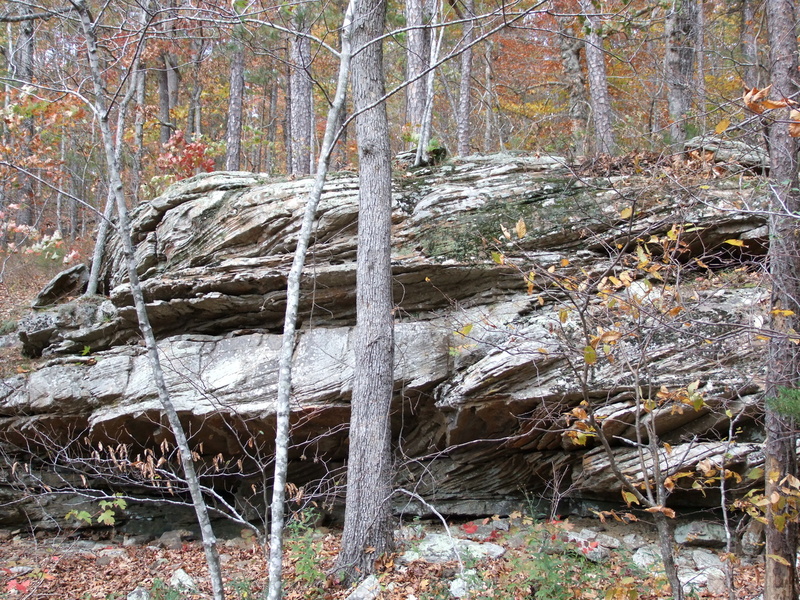 An example of what I think is called cross-bedding – rock layers running in different directions. We returned to camp for lunch and then 3 of us went to Lost Valley State Park. 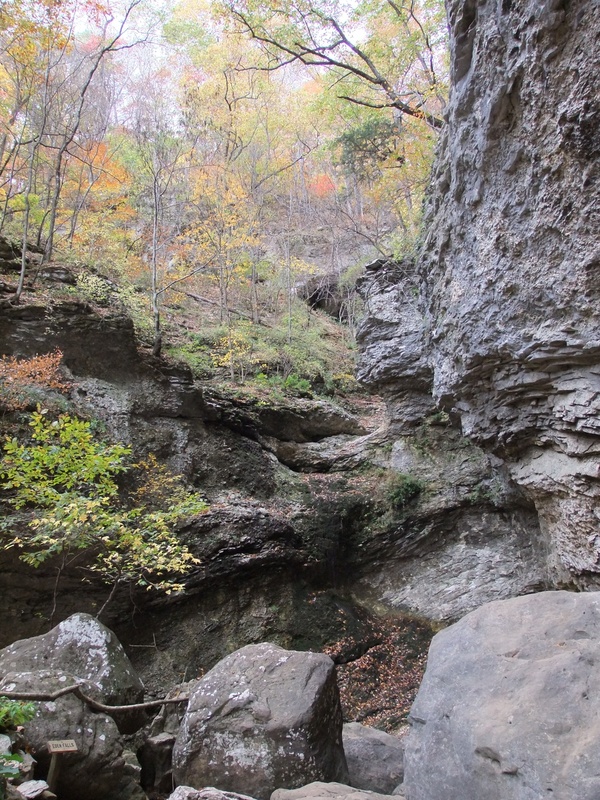 The trail follows Clark Creek back about 3/4 mile with just typical scenery (which ain’t bad) and then it hits you all at once – a tall bluff, a natural bridge, several small caves, a humongous overhang, a waterfall, and then a larger cave with a 35′ waterfall inside. A must-see area. Cob Cave. 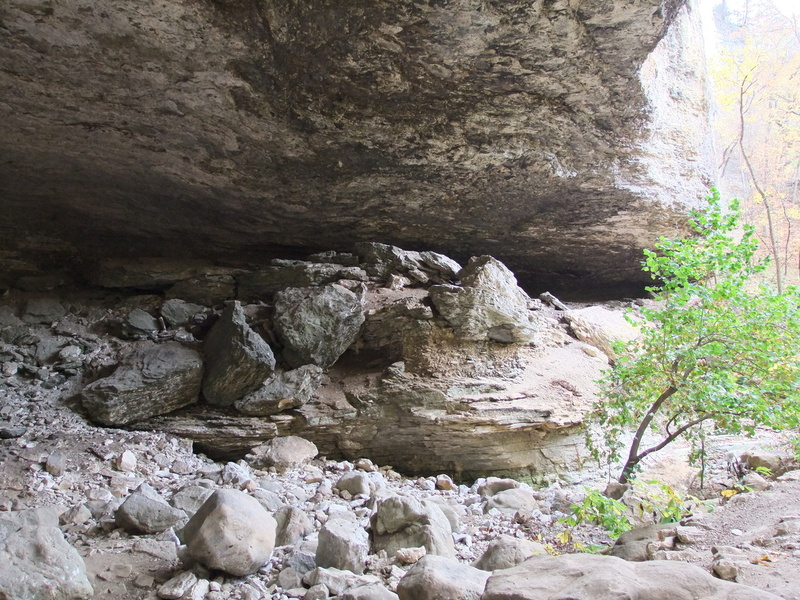 A small village could (and did) fit under this overhang. It was way too big to get all in the frame. 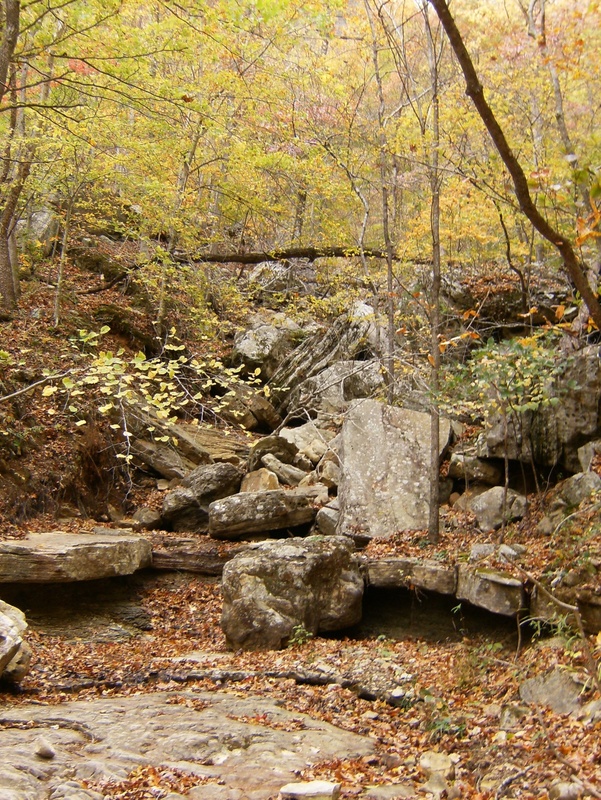 Eden Falls – a series of cascades, but mostly dry this day. 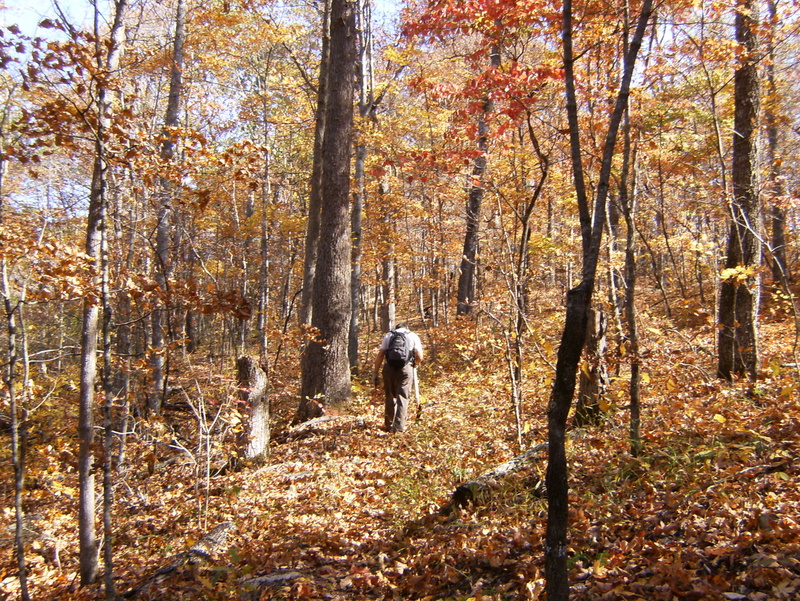 It was back to work on Thursday beginning on the Hideout Hollow trail. 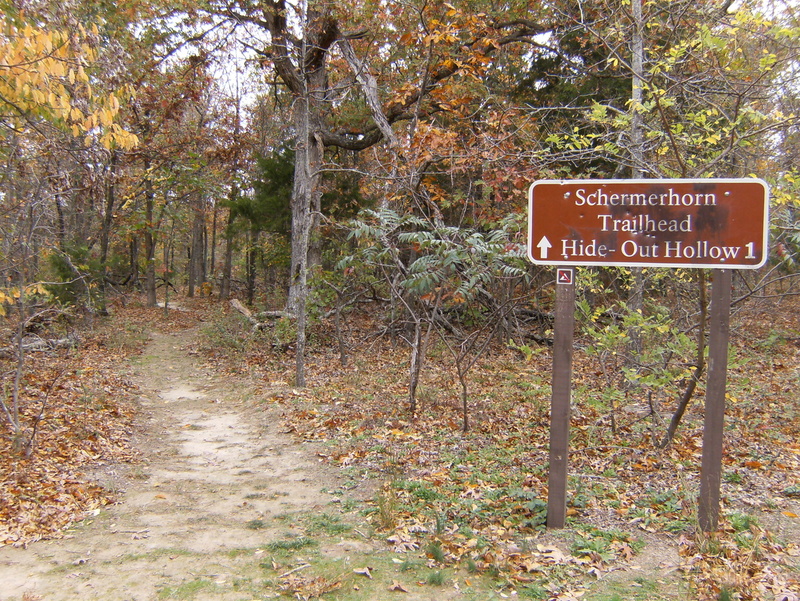 The Schermerhorn trail head is a couple miles from Compton on the north side of the old Compton-Erbie road. 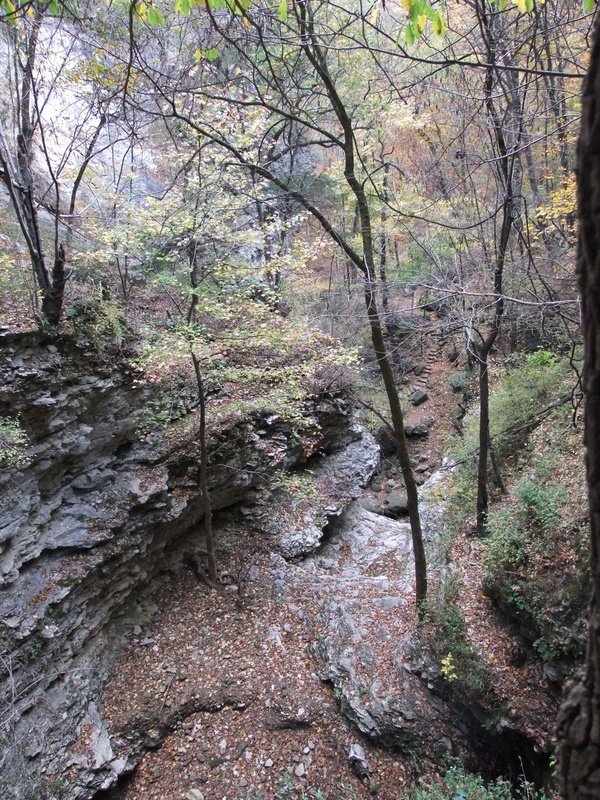 The trail runs north about .75 miles to a box canyon kinda like Hemmed-in Hollow but smaller. 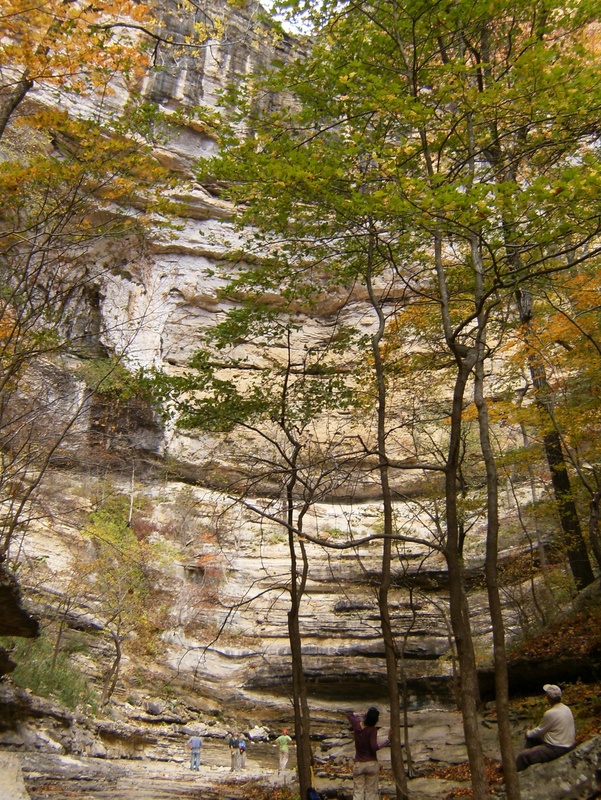 Instead of sheer bluffs, there is an overhang. 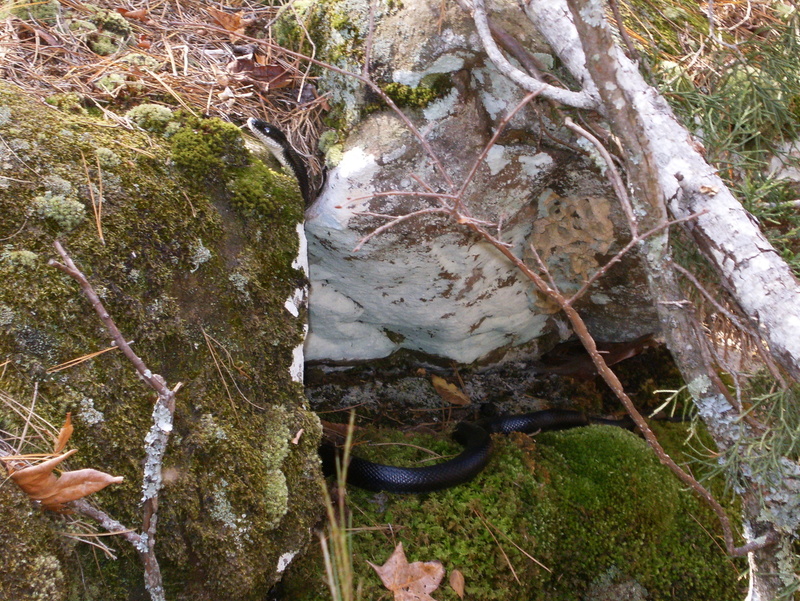 There is no obvious way to get down into the hollow from the area of the trail. The road from Compton is gravel and in decent shape. 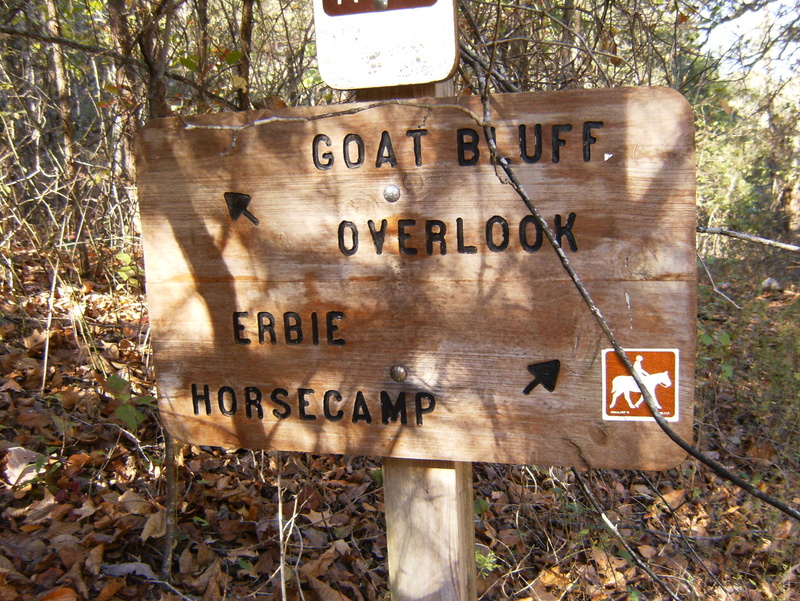 Near the trail head, though, is a sign warning that the road beyond (east to Erbie) is not maintained. If you don’t have a vehicle with high ground clearance, forget about going farther because it really does get pretty bad. Luckily we had such a vehicle (not mine) so after finishing at Hideout Hollow we went on to the old town of Erbie, where the only thing left standing is the church. 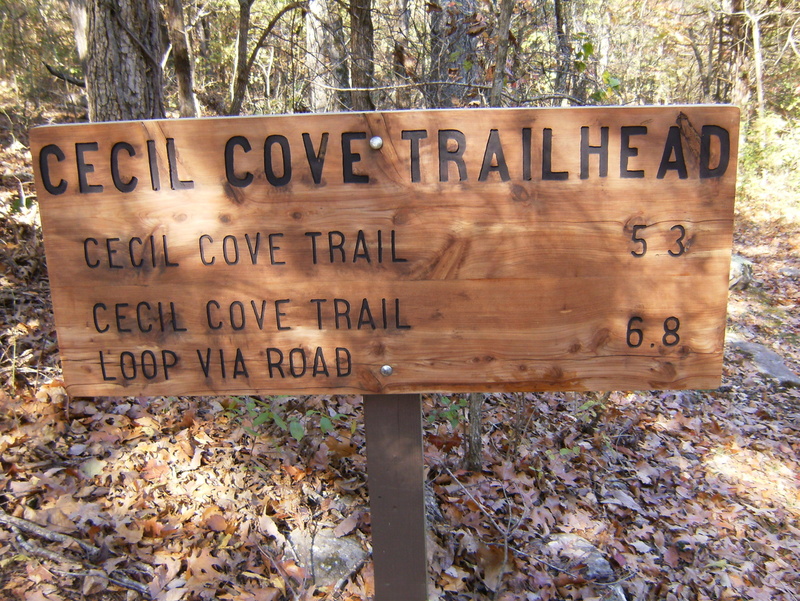 The trail head for Cecil Cove is in this area, as well as an equestrian camp and Caver’s Camp. 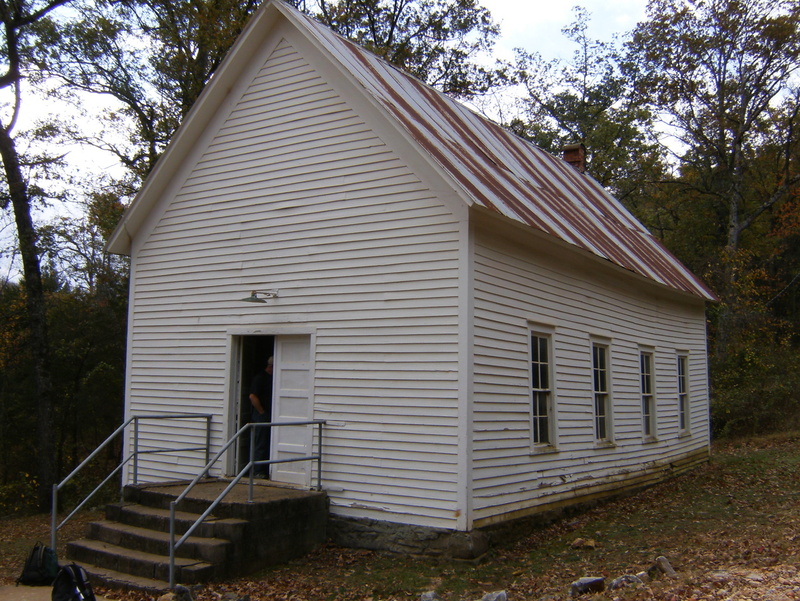 We ate lunch on the steps of the church and then headed for the Goat Bluff trail. It heads down a bit of a slope to a bluff with nice views. By this time it had started raining. 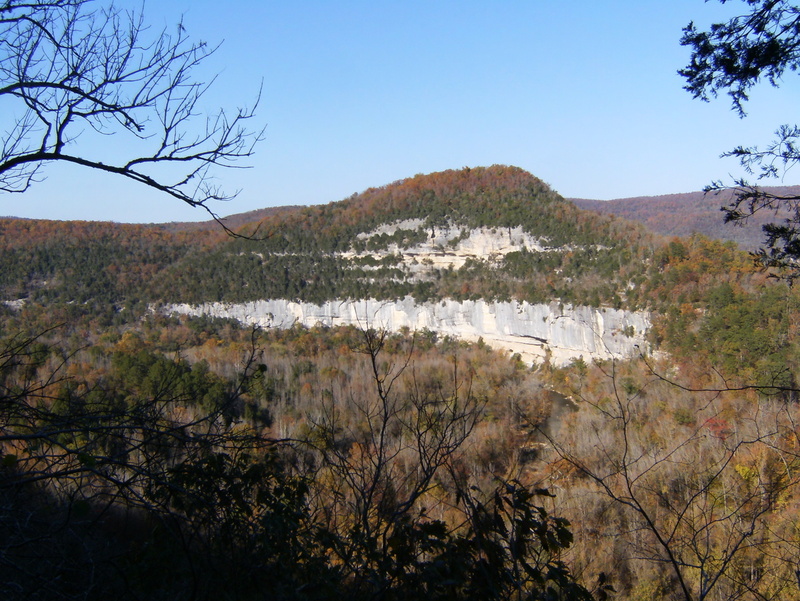 We followed the bluff east to the stairs – said to be the longest flight of stone stairs on all the Buffalo’s trails. 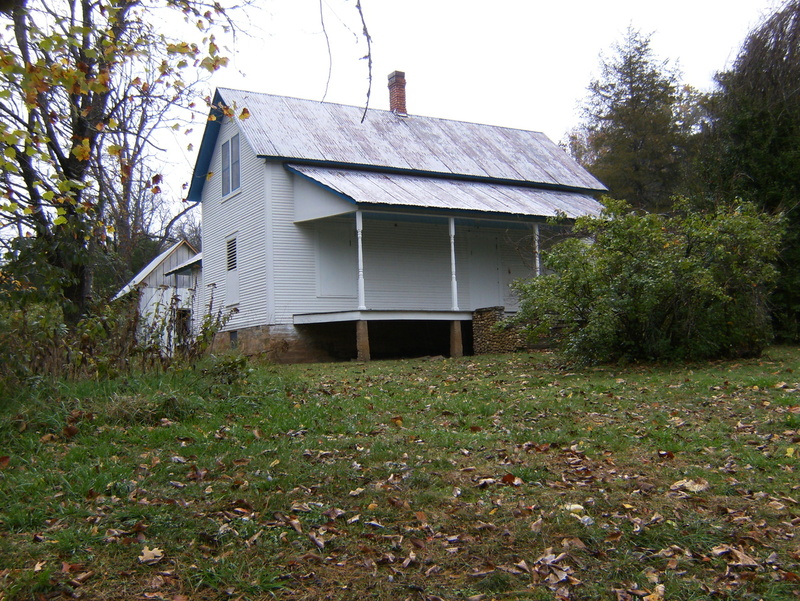 At the foot of the stairs – and the base of the bluff – is where the original town of Erbie apparently stood, though there was no visible trace. My guess is that it was flooded and then rebuilt up on the hill. 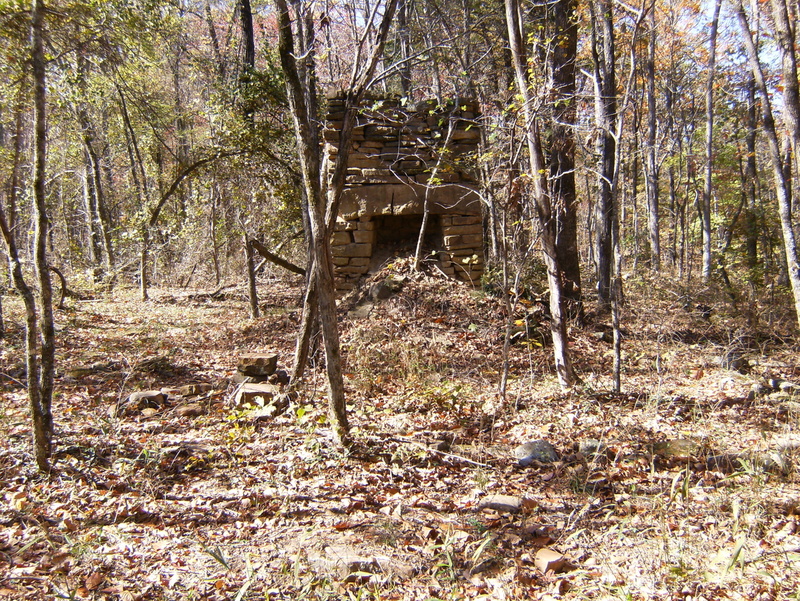 At this point we intersected the Old River Trail and continued east to the gravel road, where stands the Rulus Jones farm. 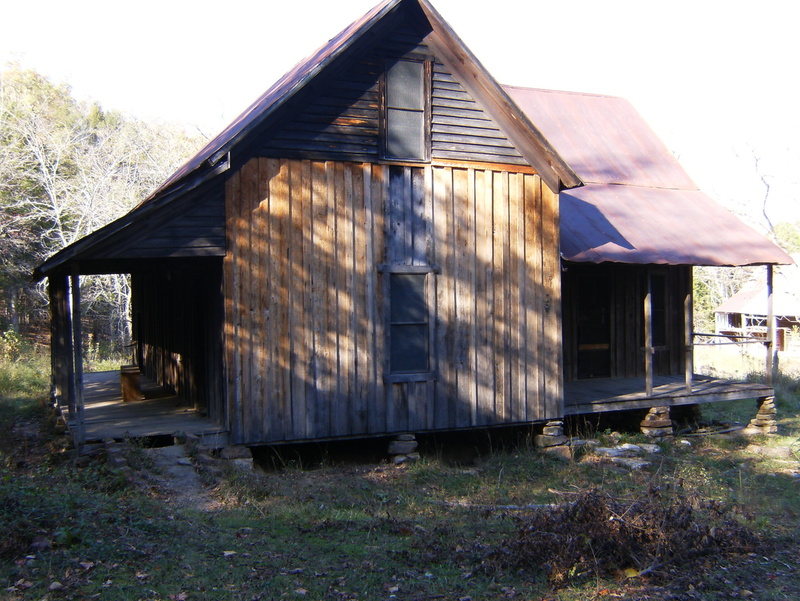 The house, barn, and outbuildings are still there and seem in good condition. Friday was our last work day. Instead of clearing brush we were going to do some repairs to the trail tread, fixing areas where the outer edge was crumbling away or the inner edge was being filled with material slumping from the slope above for example. 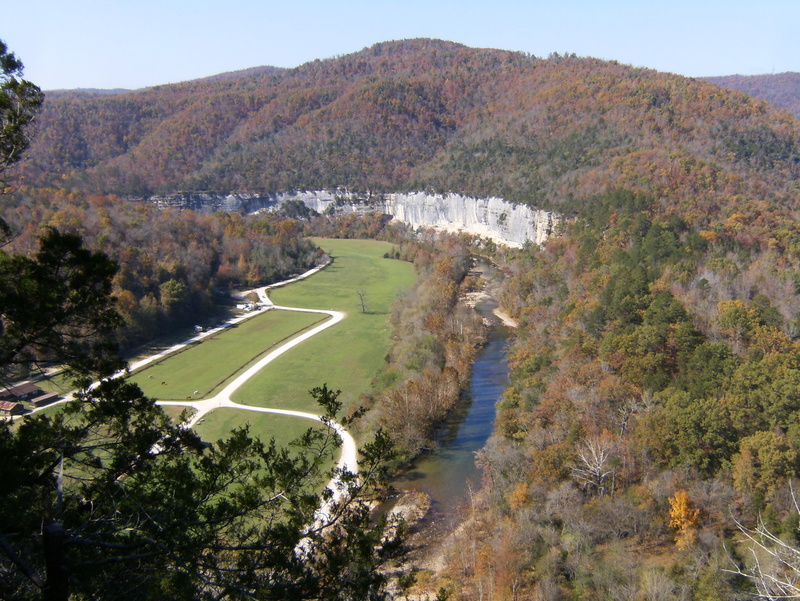 Most of us headed east from the campground on the Buffalo River Trail while a smaller crew worked their way west from about Beech Creek. The two groups met a bit east of the first overlook, on the west side of Fisher Point. 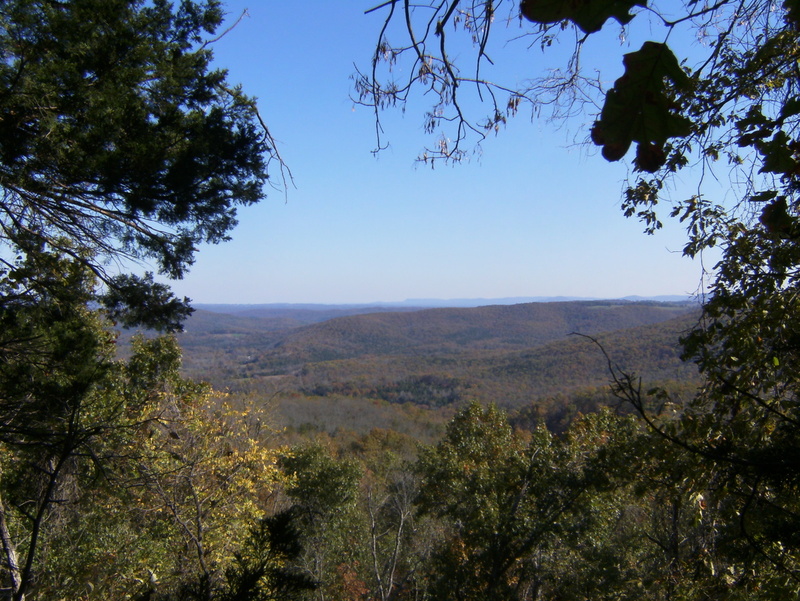 From here, we could look down both Roark and Bee Bluffs and see much of the equestrian area of the campground. The first photo in this entry was taken from here. Most people headed back to the campground at this point (several even packed and left for home) but Ken Smith wanted to continue east to the second overlook – on the east side of Fisher Point – and I needed to walk some more so I went with him. 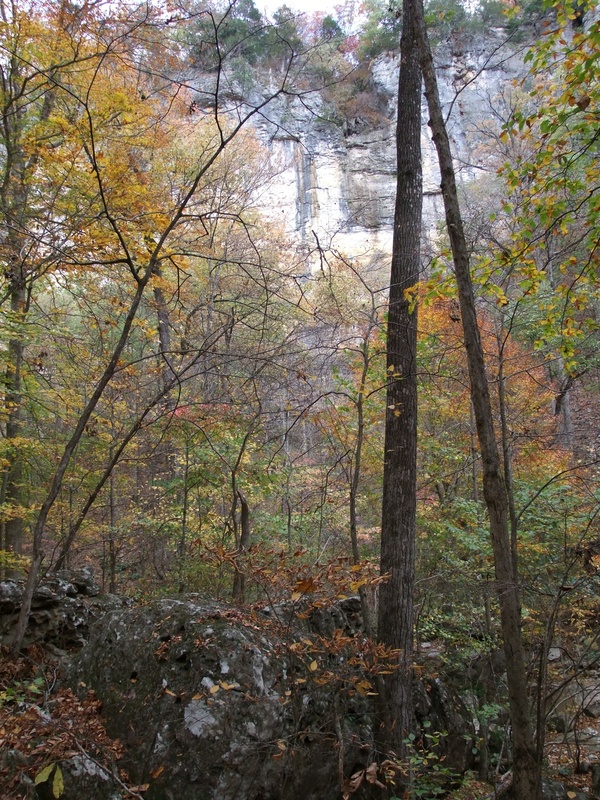 There’s a nice view of Big Bluff from there. Saturday morning the remainder of the crew, except for me, packed after breakfast and headed home. 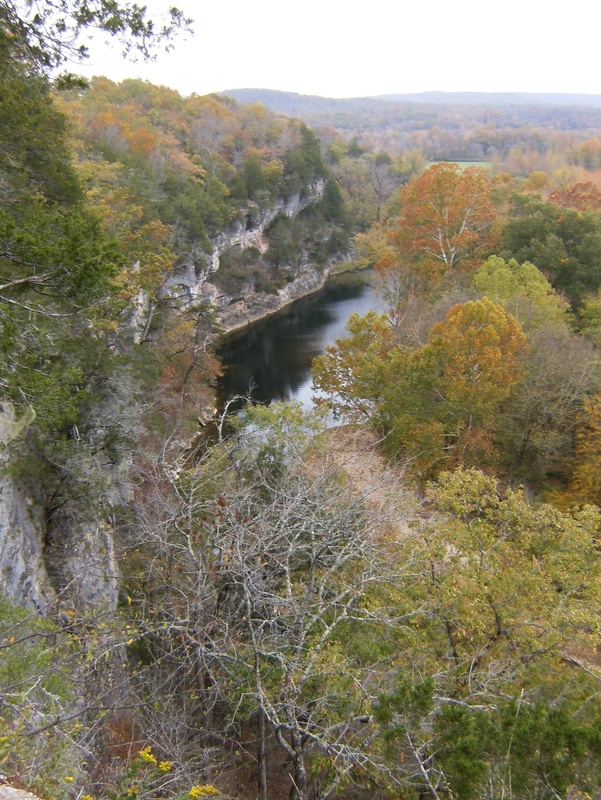 My week was in the middle of a 3-week annual trail maintenance project with the Sierra Club providing a crew the first week and the Buffalo River “alumni” crewing the third week (and some even staying and working all 3 weeks!). 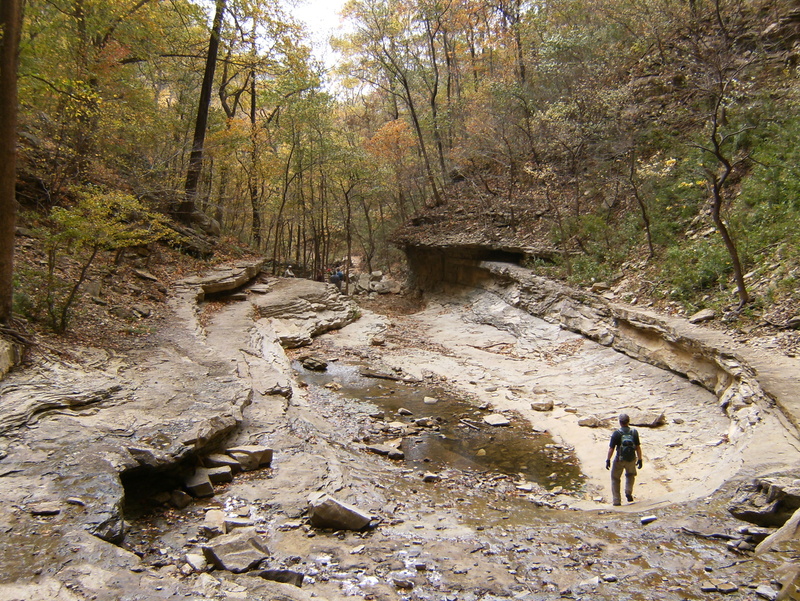 Ken Smith later estimated we collectively covered about 60 miles of trail in the area, including about 32 miles of the Buffalo River Trail itself. With the Volunteer Vacation part of the trip finished, I headed back to Erbie for a day of solo hiking. The plan was to do the Cecil Cove loop (counter-clockwise), then south on the Farmer trail and back north on the Goat Bluff trail. Getting to Erbie via the Compton-Erbie road was out of the question for my car so I took the long way – north on highway 7 from Jasper and west on a series of gravel roads from the wide spot in the road known as Marble Falls. I think it was only 8 or 9 miles of gravel road but it took me about 35 minutes. At the trail head there was a hunter getting ready to leave. 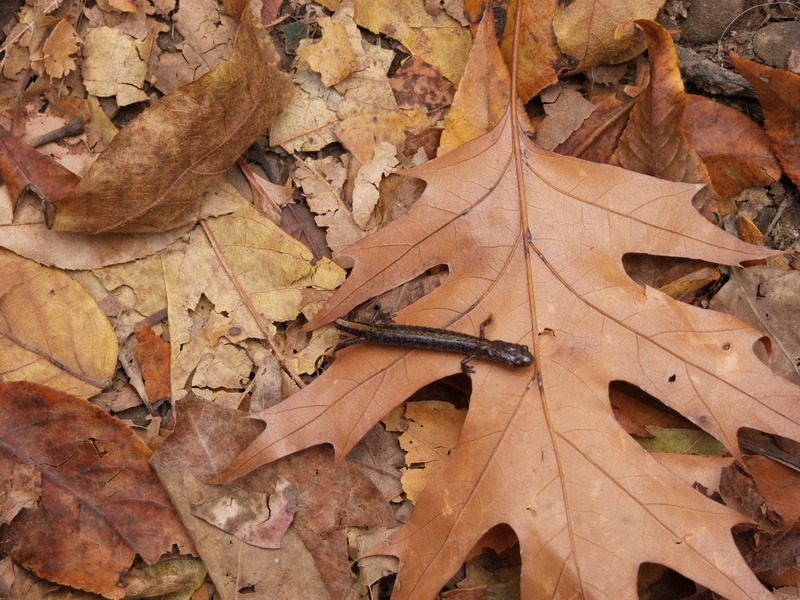 He said he heard wild pigs and saw lots of signs of rooting just a little way down the trail. That sure wasn’t what I wanted to hear. Some people say they would rather encounter bears than pigs. I had no pig experience and didn’t really want to get it while alone but I pressed forward, always keeping in mind the closest tree that I could climb. I did see where they were rooting but never saw or heard them. Good. 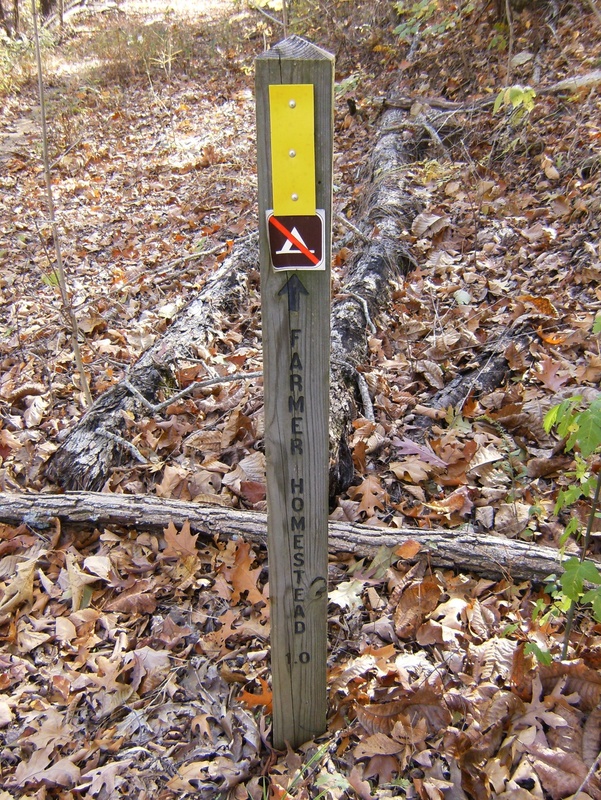 Eventually, I came to a trail junction where turning right takes you to Devil’s Den and going straight takes you up the hill. There are rocks scattered around that used to be the foundation of a church. 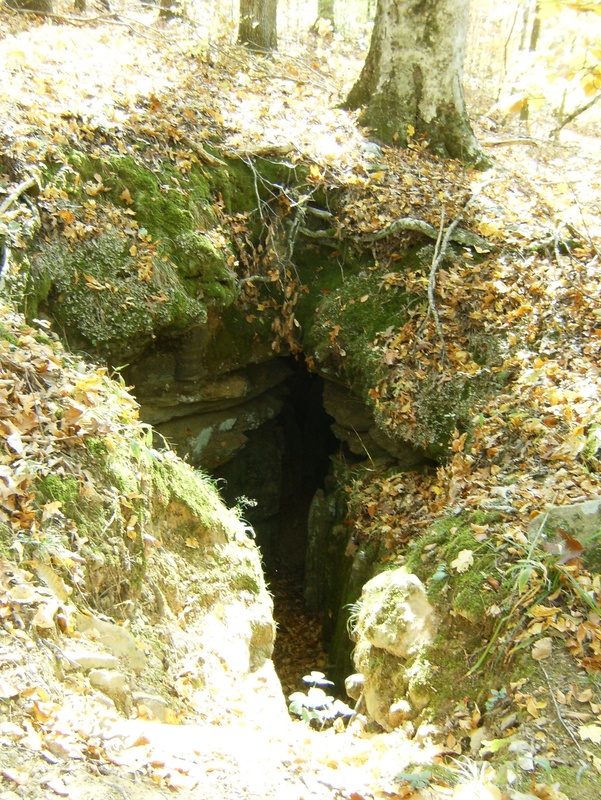 During the hot summer the congregation would meet just inside nearby Mud Cave. I skipped Devil’s Den (this time!) and headed up the hill. 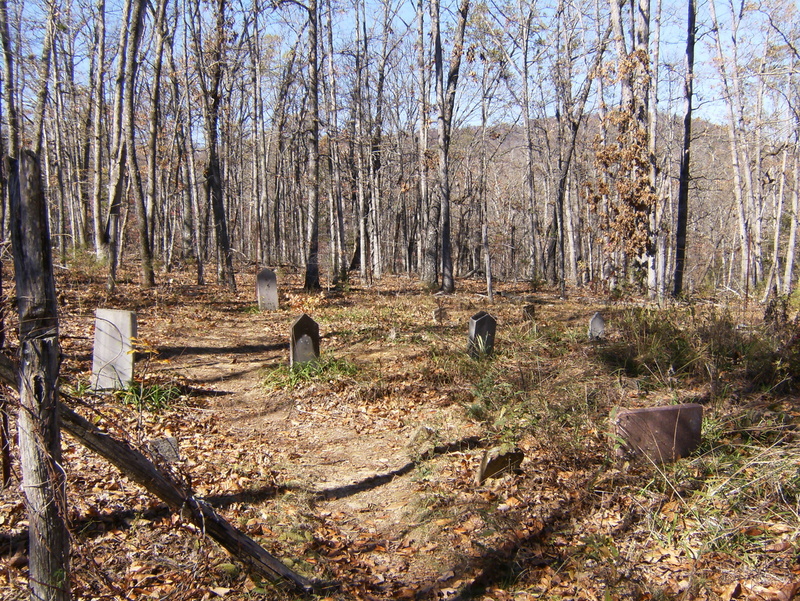 At the top is an old cemetery full of Joneses. The newest stone I could read had a date of death in the 20’s. Several stones were illegible or missing. 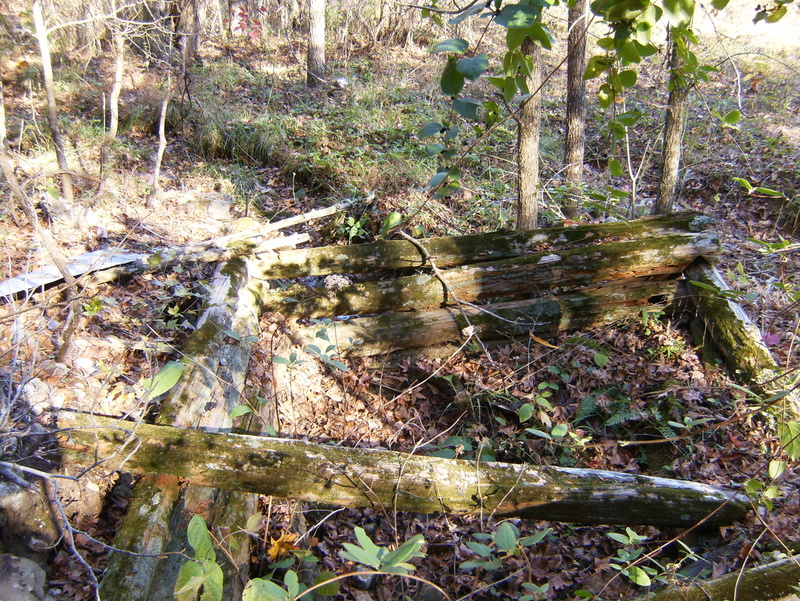 Continuing on a little way I find remains of the Jones homestead. Eventually, I came to the end of the trail at the Compton-Erbie road. I took a left and walked a few hundred feet down the hill until I found the old road leading to the next destination – the Farmer homestead. At this point, the Farmer trail meets the Old River Trail and I turned left. After a couple hundred yards I turned onto the Goat Bluff trail and started up hill to the scenic overlook where I stood in the rain Thursday afternoon. This time the sun was shining. I headed to the left and up the hill back to the trail head and my car at Erbie, drove back to camp, and had dinner. 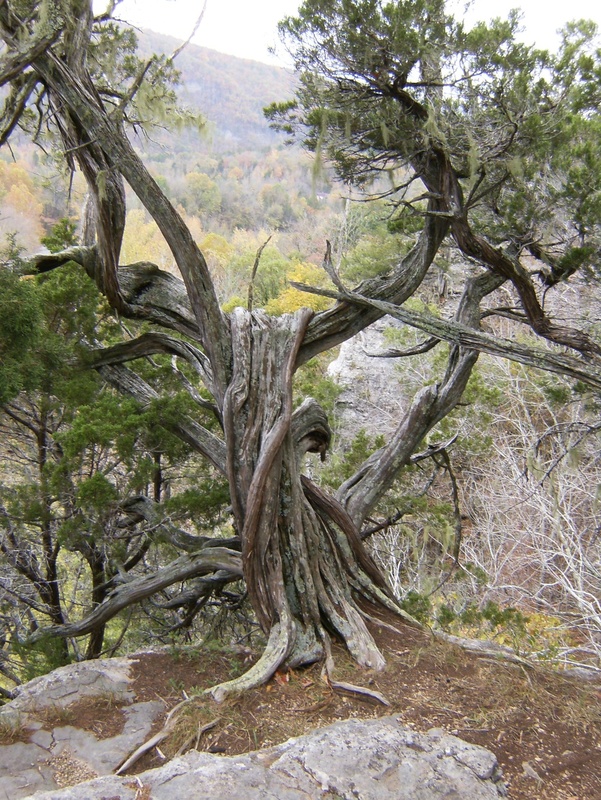 I researched short trails I could hike in the morning on my way home and decided on Round Top Mountain just south of Jasper. Sunday morning dawned with a thick coating of frost on my tent fly – inside and out. After a hot breakfast warmed me up, I packed and started towards Jasper. I just didn’t feel like hiking so I headed for home instead, arriving in the early afternoon. The end. It was a heck of a trip. I saw more of the area than I thought I would be able to, the weather was pretty good, and I met many new people that were great to work with. I see why many make this an annual event and think I will begin doing the same. This really is a special place. 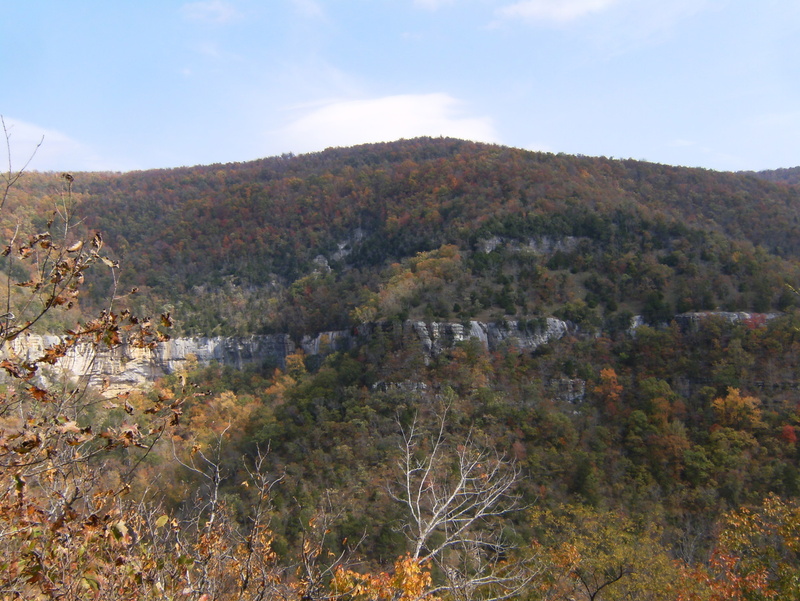 This entry was posted in Uncategorized and tagged Buffalo River Area, Buffalo River Trail, Hiking, Trail Work. Bookmark the permalink. 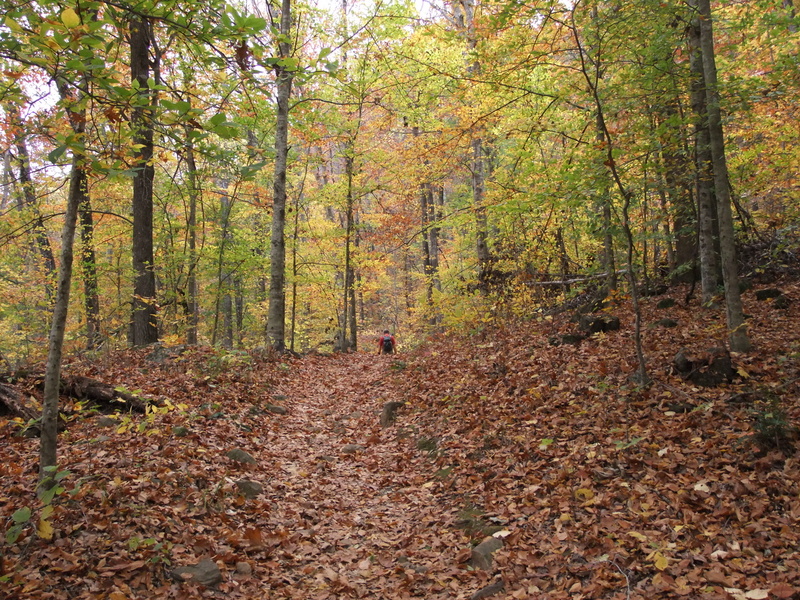 Trail maintenance, hiking and it looks and sounds like you had a great time. Thanks for the post and for the work you did. Thanks for that link. Hoping to have a story to add shortly.